All commercial buildings or complexes need world class fire protection services to improve safety and peace of mind. Our experienced fire sprinkler experts understand the importance of designing and installing the best systems in all new commercial construction projects. All of the latest and safest technologies are used every time. Commercial buildings with older sprinkler or fire prevention systems require new, effective design and a complete retrofit installation. Not only is this important to satisfy the legal occupancy requirements, but new fire prevention systems will greatly reduce damage and injuries. Existing fire sprinkler lines in commercial buildings can break, deteriorate or become damaged over time. We offer full inspection and repair services to keep all your employees safe and the property protected from catastrophe. Fire sprinklers have been used to halt building fires and reduce damage and injury for decades. They can stop small fires from growing into devastating problems that can cause a lot of time and money to recover from. Starting out in a new commercial construction with a top-quality fire protection system makes sense. With the experience gained from years of practice and the full support of multiple fire sprinkler associations and the Illinois state fire marshal, we at RidgeCP are confident in our ability to develop the right sprinkler system to suit any commercial building or complex around. Each project is approached on a case-by-case basis so the fire protection each building receives is unique and ideally suited to its structure and layout. 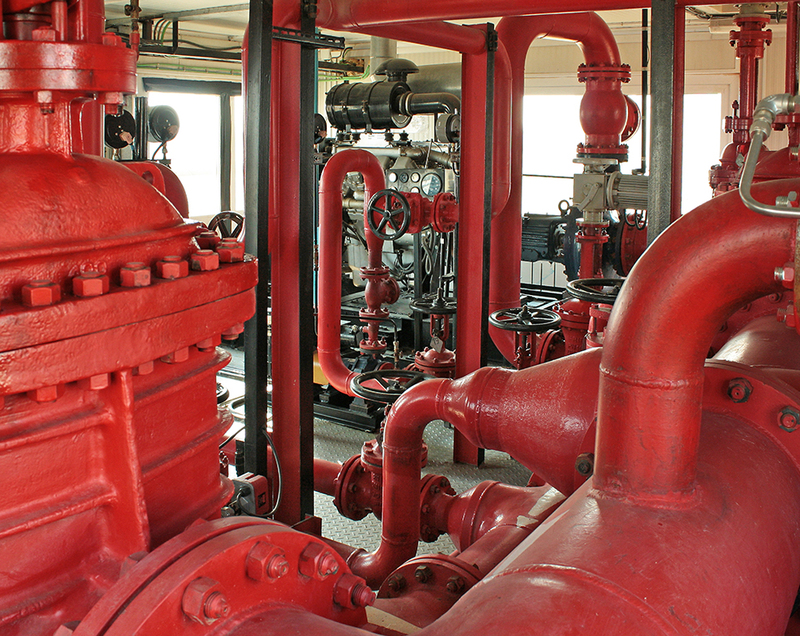 Our commercial fire protection design and installation practices include full design and installation for buildings currently being constructed, retrofitting and redesign of existing sprinkler systems for buildings that have already been built and repairs of any that are no longer working properly or leak. When it comes to safety and your property's well-being, you need to trust experienced professionals to install the most effective fire protection system available. We are proud to be associated with the American and National Fire Sprinkler Association, the National Institute for Certification of Engineering Technologies and the Illinois State Fire Marshall. When it comes to the safety of your employees, consumers and the general public as well as your investment in the property itself, RidgeCP has the experience and know-how to handle fire protection systems. Gain a sense of security with systems designed to reduce the chance of catastrophe. Every fire sprinkler project we undertake includes a sense of responsibility for every person who enters that building.